Did anyone start watching the Bachelorette(s) last night? I wasn't sure I was even going to start this season because I hated the idea of having 2 bachelorettes so badly, but now I'm of course sucked in. Damn you, ABC, and your cliffhangers! Maybe I'll share my thoughts on the week's episodes in a separate post, because today, I have food on my mind! 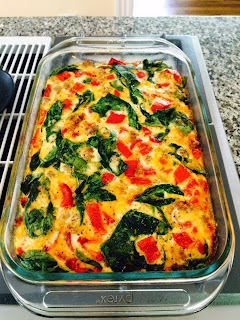 A while back, I was looking for a way to cut some carbs and add more protein into my daily breakfasts, especially during the week. I love a good egg casserole, but wanted to come up with something a little more waistline friendly so that I could eat it daily and feel good about it. 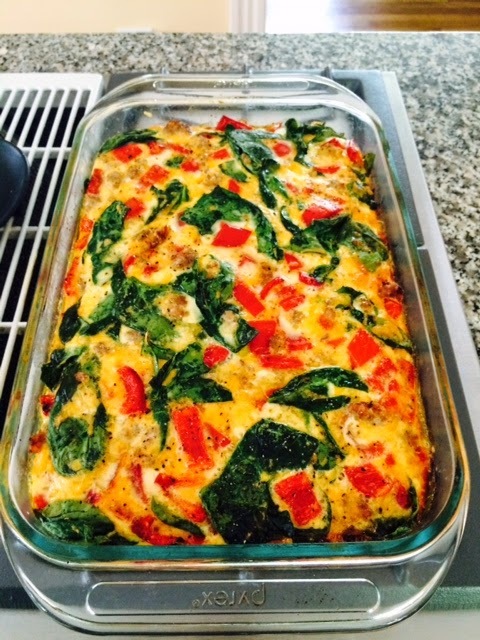 Enter the Sausage & Veggie Breakfast Bake! I will mix this recipe up on Sundays, bake, then slice into good-sized pieces to take in Tupperware to work. Pop in the microwave for about a minute, add some salt & pepper or hot sauce/ketchup if that's your thing, and you're good to go! I also make this dish every time my Mom comes to visit, she loves it! Since she was just here for the weekend, I'm sharing it with you now. 2) Brown up your sausage in a large pan or skillet. 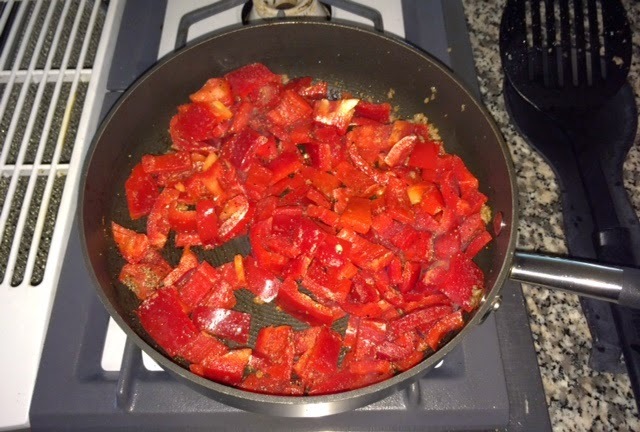 3) Once your sausage is done browning, use the SAME pan to cook up your red peppers over medium heat. Add in the garlic powder, pepper, and salt. Cook for about 5 minutes, keep stirring and try not to burn. (Make sure when you chop up the peppers you take off that sticker. This time around, I had a major blonde moment, forgot to do so, and was playing where's waldo picking pieces of stickered-slices out of the pan burning my fingers. Good times). 4) Spray a 13x9 inch glass dish with PAM or any cooking spray. 6) Add in your sausage as the second "layer." 7) Next goes the red peppers. 8) In a large bowl combine eggs + egg whites, along with your milk. Whisk this together until all the yolks are mixed in. It's very important to use a WHISK, okay? :) This makes things fluffy. 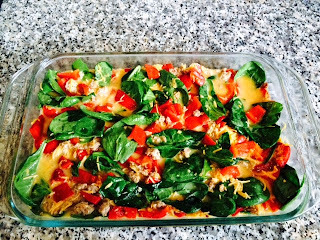 9) If you're using cheese, you can either spread it as another layer over the red peppers, or mix it in with the egg mixture. Your choice. 10) Pour egg mixture over all of the other ingredients in the pan. 11) Use a spoon to lightly combine ingredients in pan so it looks "even." 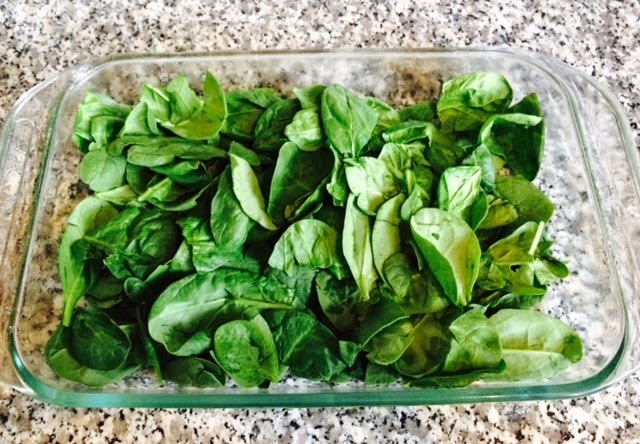 12) Pop in the oven for about 40 minutes. 13) Slice up, and enjoy! Sometimes, I even through a little avocado or guacamole on top of my slice.